Come See Us! We invite all current and potential clients to visit our St. Louis web design studio/offices and meet with us in person. 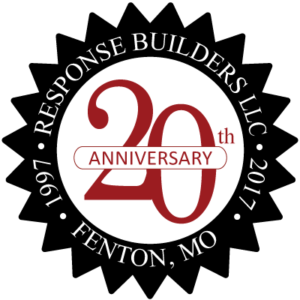 Recently, Response Builders renovated our entire office space in St. Louis creating a new, state-of-the-art website design lab. Our area is fully equipped with the latest computer equipment and an environment conducive to creative work. In addition, our facilities include a large conference room suitable for large meetings and seminars. We invite all current and potential clients to visit our St. Louis web design studio/offices and meet with us in person. When you stop by, don’t be surprised to see our designers fast at work developing creative websites and implementing the latest in search engine optimization techniques. it’s easy, click to schedule a visit to our St. Louis office and receive a free web site design consultation. continue east on hwy. 44 service rd. take first right, Fabic Dr.
take first left, Fabricator Dr.
our address: 1600 Headland dr.
exit immediately onto Soccer Park Dr.
continue on Soccer Park Dr.
take second right, Fabricator Dr.
take first left, Headland dr.